As the G8 summit is set to focus on climate change – currently the burning global issue – the U.S. is being widely accused of ignoring what is happening and President Bush's latest proposal for action has left many experts sceptical. With reports of record temperatures being reached in every region of the world, and with images of icebergs melting and glaciers receding being broadcast in every medium, the debate over global warming is rarely out of the headlines. Although still controversial with some politicians, the majority of scientists say that humans are causing global warming by polluting the atmosphere through the emission of greenhouse gases. “Yes, it is real, we know this because scientists have told us that if we didn't have the phenomenon of global warming or climate change the world would be far colder than it is now,” believes Alden Meyer, Director of Strategy and Policy, Union of Concerned Scientists, Washington, D.C. But some groups, including the Bush Administration, question the evidence. Jeff Kueter, President of the Marshall Institute, says people get carried away by statistics and inaccurate data. “It's those projections going forward to 2100, the melting of the Greenland ice sheets and Antarctica and all that, that cause people great consternation and worry. But the reliability of those forecasts is something I would suggest that people question and take a very hard look at, whether they think those forecasts are actually as reliable as they are made out to be,” he noted. With both the Earth's temperature and the debate over global warming heating up, more groups are criticising the U.S. for lagging behind other nations in combating global emissions and greenhouse gases. “Basically under the Bush administration the U.S. has been absent from the playing field on this issue, we have refused to join the Europeans, the Japanese and other industrialised countries in taking on mandatory commitments to reduce our emissions of global warming and pollution,” Alden Meyer stressed. With the U.S. being the largest emitter of carbon dioxide and feeling increasing criticism for not taking the lead in mandating pollution cuts, President Bush unveiled a new plan for reducing emissions by half by the year 2050. “By the end of next year, America and other nations will set a long-term global goal for reducing greenhouse gases. 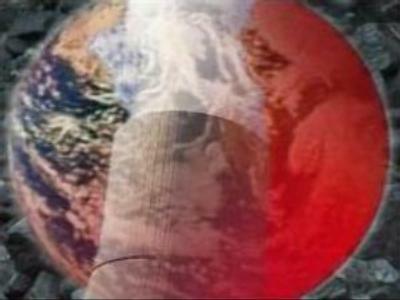 To help develop this goal, the United States will convene a series of meetings of nations that produce most greenhouse gas emissions, including nations with rapidly growing economies like India and China,” George Bush stated. But some experts caution against using government intervention to set up climate initiatives. “If we were to wake up tomorrow and say we want to increase corporate fuel economy standards, the fuel efficiency of our automotive fleet by 25% overnight and snapped out fingers and made it so, within six to seven years all the gains that you from that magic increase in fuel efficiency would be wiped out, and they would be wiped out through no fault of your own except that your economy would have grown and you'd add more people to the system. And the developing world would add more cars to their fleet as their standard of living goes up,” Jeff Kueter pointed out. President Bush announced his long-term climate change strategy, just ahead of the upcoming G8 summit in Germany. But so far, the White House says it will not support the cap and trade system that has been accepted by other countries to reduce carbon emissions. And with global warming set to be a major topic of discussion at the upcoming G8 summit, the U.S. may find itself faced with a showdown in a fight to control climate change.